Q. What is a PAN? A. PAN (Permanent Account Number) is a ten digit alphanumeric number issued by Income Tax Department. 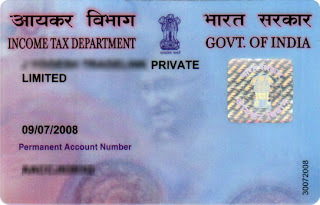 This is issued in form of a laminated card (called PAN card). A. All tax payers who are required to furnish Income Tax Return should have a PAN. All persons intending to enter into financial transactions, where quoting of PAN is mandatory must also obtain PAN. Q. Can I have more than 1 PAN? Q. How do I apply for PAN? A. You need to fill up Form 49A and apply for PAN. You can apply for PAN online or offline. Click here to apply for PAN online. Alternatively, you can submit the completed Form 49A at IT PAN Service Centre or TIN Facilitation Centre. Q. What documents are required with PAN application? To know more about PAN, visit our PAN Card FAQ. . APPLY FOR YOUR PAN CARD NOW (takes you to govt. site).